audio contains information that your doctor never may have told you, including warning symptoms you must not ignore, how to fight back--and win--against diabetes, a weight-loss diet you can live with, and important information about the use of natural supplements. You want to be healthy. God wants you to be healthy. 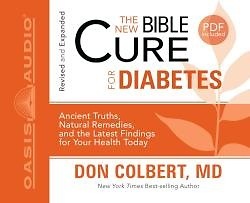 Now this highly anticipated revised and expanded edition from the Bible Cure series is available to help you get healthy--body, mind, and spirit.